Lincoln Wood Products, Inc. has been manufacturing high quality wood windows and patio doors for new construction, remodeling and light commercial projects for well over half a century. Based in Merrill, Wisconsin, the privately owned company engineers windows and patio doors for visual appeal as well as outstanding performance and backs it up with exceptional customer service before and after the sale. 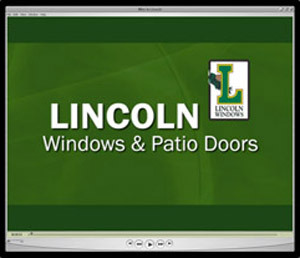 Lincoln windows and patio doors are marketed through a network of over 400 independent distributors throughout the U.S and Canada. We manufacture and assemble a complete line of wood windows and patio doors out of multiple facilities in Merrill, WI and we ship the products nationwide. Over 64 years after its founding, the finely crafted windows and patio doors reflect the company’s long tradition of excellence. The belief and commitment to quality has been passed down to the many generations of employees and continues to be driving force in the company. In 1947, Carl & Jane Bierman purchased and renovated an old dairy farm and Lincoln Wood Products began. At the time, Carl had 10 years experience in the millwork industry, and together with his wife Jane, shared a dream and a desire to succeed. They had very firm ideas on how the business should be run and worked hard to establish their ideals. 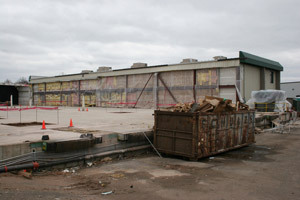 As the company grew, the original building was expanded several times and new facilities were purchased and built. 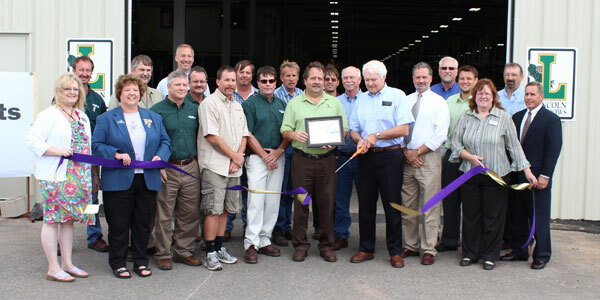 Today the company encompasses over 500,000 square feet of manufacturing space in multiple facilities in Merrill, Wisconsin. Customer service is the #1 priority and is always evident at Lincoln. Another company focus is the continual evolution of our product lines. We are constantly integrating technological improvements and expanding our product line through extensive research & development. Our staff utilizes state-of-the-art fabrication equipment and in-house testing facilities to design and build high quality fenestration products. All Lincoln products are certified and verified by independent testing firms. 60+ years after its founding, the finely crafted windows and patio doors reflect the company’s long tradition of quality craftsmanship. The belief and commitment to quality and work ethic has been passed down to the many generations of employees and continues to be an inspiration and driving force in the company. In the early 1990's, the market was opening up for an all vinyl window and patio door product line. Being a longstanding wood window manufacturer didn't deter the Bierman's from recognizing the benefits of an all vinyl product. They saw how vinyl windows could complement the traditional wood and aluminum clad wood offerings from Lincoln. 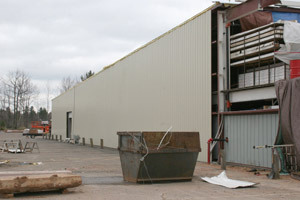 In 1994, after much research, Timeline Vinyl Products, Inc. was established as a sister company to Lincoln. 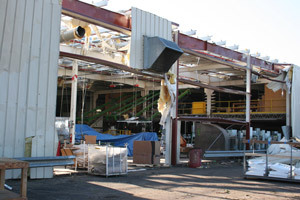 On April 10th, our corporate offices and final assembly plant were severely damaged by a category EF3 tornado that hit Merrill, Wisconsin. This was one of eleven confirmed tornadoes that hit our state that day. 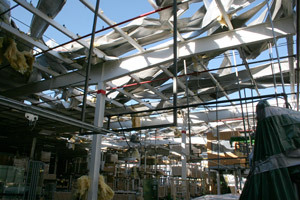 Locally, over 60 homes and 12 businesses were either damaged or destroyed. 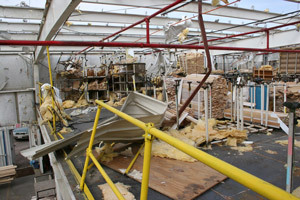 Even though the area was heavily hit, only minor injuries were suffered in the community. The only injury at Lincoln was sustained by a security guard. 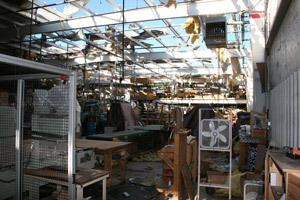 Luckily, the tornado impacted on a Sunday evening when personnel were not working. 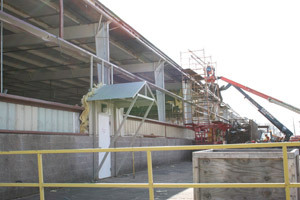 Lincoln maintains multiple production locations in Merrill and fortunately only the final assembly plant and offices were damaged. We were able to reposition the departments that were affected to our other facilities and resumed production within 3 weeks. Communications were limited during that time. 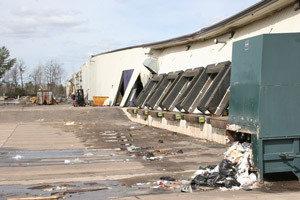 Our Timeline facility was not damaged by the tornado and was fully operational once shared computer operations were restored. Production soon resumed on existing and incoming orders. The community really came together in the support of the businesses and homeowners affected by the tornado and we were reminded how blessed we are to live in this area. We also wish to thank our dealers, vendors and even some of our competitors who so generously assisted us during this time. Their thoughtfulness will be remembered. At Lincoln, going green goes way beyond a simple mission statement and a long-term agenda. It fits directly into our corporate philosophy of quality and performance combined with lean manufacturing efficiencies. Being proactive in regards to energy conservation, resource management and recycling are all key in how we approach our impact on the environment. As a community leader, we know that benefits made by stressing environmental stewardship will be reaped by future generations of Lincoln employees and their families. It’s an obligation that we take very seriously and we are proud to help control our environmental impact locally, while helping homeowners nationally through their use of our high performing windows and patio doors. Committed to protecting and preserving the environment. Committed to manufacturing energy efficient products. Many of our products are tested and certified for water penetration, air infiltration, structural integrity, thermal integrity and acoustical performance. We also offer numerous product enhancements to increase energy savings such as thermal breaks, weatherstripping and performance glass. In addition, we engage in lean and sustainable manufacturing processes and strive to use suppliers that do the same. Many of our products carry certification by the National Fenestration Rating Council (NFRC). In addition, Lincoln is an ENERGY STAR Partner. One portion of a products certification is derived from computerized simulation, which computes the thermal value of the product. Another is physical testing to establish air and water infiltration and structural performance. We strive for the best in our windows and doors. 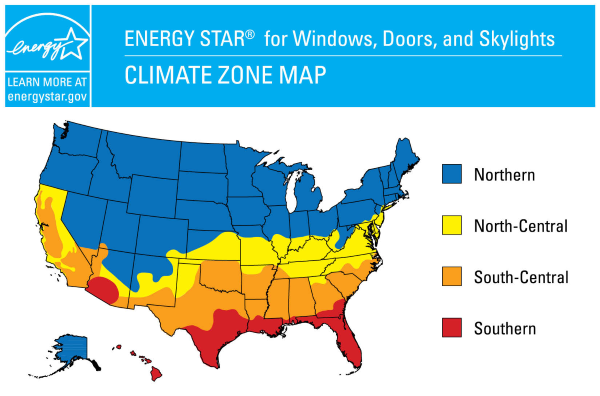 ENERGY STAR is a voluntary partnership between the U.S. Department of Energy, the U.S. Environmental Protection Agency and the fenestration industry. It is designed to assist consumers in the recognition of energy efficient products and promote the environmental and economic benefits of these products with the ENERGY STAR label and other program activities. Find additional information regarding the ENERGY STAR program and available products by visiting www.energystar.gov. NFRC (The National Fenestration Rating Council) is a non-profit organization that administers the only uniform, independent rating and labeling system for the energy performance of windows, doors, skylights, and attachment products. Additional information regarding the NFRC can be found at www.nfrc.org. 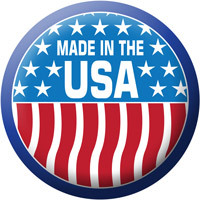 The Lincoln family of products is certified by an independent source. By sending our products to be verified by another lab, Lincoln customers are assured of weather tight and structurally sound windows and patio doors. The reported data includes size of window tested, air infiltration, water test pressure and structural test pressure. We also indicate our performance grade (DP Rating). Glass is undeniably the most thought about, debated and prevalent component of a window or patio door. Lincoln uses double strength (or thicker) glass on every product we manufacture. Heavier glass is more resilient to stress cracks and seal-failures, the leading cause of glass issues. Quality fenestration products always have double strength glass-Lincoln always has double strength glass. Combined with warm edge spacer technology, our glazing systems start showing their true potential. An insulating glass unit (glass, spacer, glass) has a significant influence on the energy performance of the total window. This important factor is why Lincoln offers several different glazing choices. Glass can be clear insulated, LoĒ², LoĒ³-366™/Neat® or multiple obscure, tinted and laminated choices. The newest option, Dual Low-E, combines Cardinal i89 to surface four and is combined with LoĒ². StormPoint impact product uses a laminated glass system with a vinyl plastic interlayer designed for hurricane prone areas. Laminated glass may crack from flying debris during impact but is more likely to remain intact. A video introduction to the Lincoln family. The video is an effective, colorful and informative presentation detailing our business attributes, product offering and company overview. Every new residential project is the culmination of a persons’ dreams. Product selection, from flooring to shingles, are all key elements to fulfillment of that dream. Lincoln windows and patio doors are made to compliment any architectural style in size, shape and color to help your dream become a reality. Your home is where your heart is. Do a makeover on something you love! There has never been a better time to improve comfort levels, lower energy costs and increase market value. Our Revitalize Series includes remodeling products designed specifically for your next replacement window project. Lincoln will produce to exact opening sizes and can do so with a variety of products. Lincoln and Lincoln dealers will work diligently to provide product to your exacting specifications. A school, library, office complex, country club, fire house, armory, hotel, assisted living facility, or condominium – one thing these examples all have in common is their Lincoln windows. Some installed in new construction, some as renovations. Lincoln windows, beautiful as residential products, also meet the demands of light commercial applications. Built to withstand the rigors of harsh coastal environments, StormPoint Series windows and patio doors by Lincoln can help protect your home or business against high winds and debris. Our impact resistant glass is designed to meet building code requirements without the need for shutters. Historically, aluminum became the low-maintenance exterior choice for several key reasons. Aluminum is relatively easy to fabricate, provides exceptional structural support, receives paint extremely well, requires minimal maintenance, and is not easily dented. 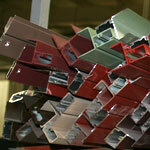 At Lincoln, we use high quality ‘extruded’ aluminum profiles on both the sash and frames. This creates a very durable exterior product that when painted, also resists fading. Aluminum is 100% recyclable. Closed cellular PVC window components are increasing in popularity as a high-quality exterior window component. Interestingly, Lincoln has been using cPVC for at least a decade. This material is scratch resistant, paintable and will not sustain mold. Products in our Traditions Collection (Primed) and Innovation Collection (Hybrid) utilize cellular materials in rot-prone areas; primed wood brickmold, casings, blindstops, sills and sill-nosing are replaced by cPVC because the core will not absorb moisture - no expansion and contraction. Cellular PVC material cuts like wood and allows Lincoln to customize trim widths. 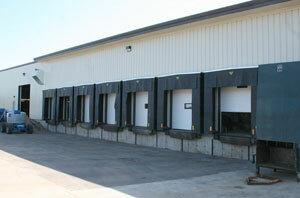 Flat casings can be specified in various sizes that enhance curb appeal in new construction or retrofit applications. 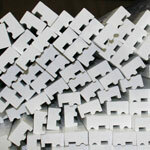 Williamsburg and 4-1/2” Backband cPVC trim profiles are also available. 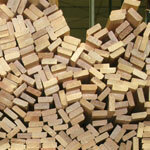 Since 1947 wood has been the very heart of our business. Lincoln is conscious of every bit of wood fiber that we handle and our focus on the future is very clear. 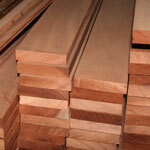 Our process starts with purchasing an excellent grade of lumber. Better lumber produces more usable yield with less waste. Cosmetically, it also looks better as a finished product. Recycling our wood is an everyday procedure for Lincoln. Some of our by-products are converted in to wood flour which is an important component of products such as wood pellet fuel. A craftsman is defined as a person who practices or is highly skilled in a craft. That describes Lincoln’s manufacturing employees perfectly. Our tenured production staff makes every effort to build high-quality products and ship your orders on-time and complete. Isn’t that what it’s all about? 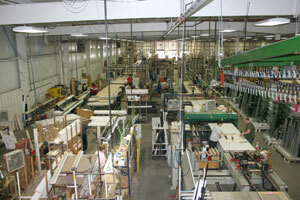 To support those efforts, we continually monitor and improve our windows and patio door production for quality. Technologically advanced equipment, modern facilities, dedicated hard-working employees and superior fenestration products—that’s Lincoln!!! Our business is based upon building long-lasting relationships. We know that a company's most important asset is it customers. Our trained staff strives to cultivate these vital relationships by answering product questions during the quoting process, resolving issues quickly during purchasing cycle and providing high-quality assistance throughout the use of our products. Lincoln’s knowledgeable customer service staff is dedicated to your account by region so we can begin to understand the needs of each geographical area. The age-old saying goes a little like this: a warranty is only as good as the company standing behind it. Well, Lincoln has over 63 years of experience crafting high quality products and a superior level of customer support after-the-sale. Please review our warranties and have the peace of mind that Lincoln windows (and warranty) are working hard for you. Lincoln offers a wide range of exterior options including: aluminum clad, vinyl clad, hybrid, primed and natural wood. All five exterior choices provide designers a distinctive look, offer tons of options, and are protected by a fantastic warranty. Aluminum Clad - Aluminum clad products have the ability to be virtually any color. Lincoln offers eight standard colors, thirty-eight feature colors, seven spray-on anodized colors and have the ability to custom color match from a customer's sample. Vinyl Clad - Our vinyl clad line is an optimal choice for outstanding thermal performance and greater resistance to harsh costal environments. Available in three popular colors; white, sandstone and adobe. Primed Wood - If a painted exterior is what’s desired, we have a great line of primed products constructed with traditional trims and historical design features. 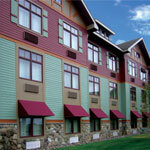 cPVC components replace rot-prone wood parts and are ready for heat-resistant paint. Hybrid - Lincoln’s unique way of combining aluminum clad or vinyl clad sash with a primed frame. 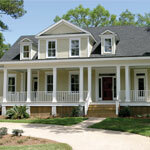 This package creates a low-maintenance and durable window with historical charm. All of the factory applied exterior trim options available in our primed line are also available here. Natural Wood - For that luxurious and elegant feel we offer natural wood products in pine, mahogany and fir. These all-wood products (both interior and exterior) showcase the distinctive warmth and beauty of wood, and are capable of blending in with natural siding materials. Naturalist designer…meet unparalleled product beauty and flexibility…Lincoln’s Traditions Series all-wood windows and patio doors. Pine is a staple throughout the wood window industry. Initially pine was chosen because of its abundant supply. Pine is also very easy to process and has a very consistent aesthetic appearance. 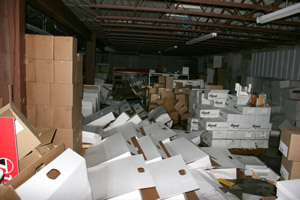 We manage a very large inventory a pine window parts — that means quick lead times. Lincoln takes this approach one step further. For the distinctive project, employ the super-rich feel of natural Mahogany or Douglas Fir wood products. Both of these alternative wood species stain to an excellent finish making this type of wood very appealing. Alternate wood species may take a little longer to get because Lincoln orders wood specifically for each job because they are individually milled and fabricated for your order…They’re worth the wait!!! Looking for something other than a pine interior? Choose from these alternative wood species: oak, cherry, douglas fir, mahogany or alder. At Lincoln, we team up with quality hardware manufacturers throughout our entire product mix. 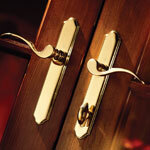 Durable, fine-looking hardware is essential to our goal of building the best windows and patio doors possible. The performance and strength of Truth’s Encore operator is testament to the total quality packed into the Lincoln casement window line. Encore hardware requires 33% less cranking effort and the full-flip handle reduces collapse during operation. Other features such as self-storing handles and popular finish colors garner attention from architects, builders and homeowners. HOPPE® door hardware combines durability (multi-point system) and beauty (ten elegant finish colors) in every handle set. Multi-point systems are the standard of excellence by keeping door panels straight and maintaining weatherstrip contact. Design choices include several backplate and handle styles which create a very broad selection intended for a unique look. Lincoln, Truth and HOPPE® are all about high-end choices and these quality vendors are just two examples of our many component suppliers. Our hardware is designed to bring harmony to your next building project and is sure to make a design statement all while lasting for years to come. Lincoln continually improves and refines our business while remaining focused on the most important thing, our customers. Our entire team is committed to providing value-oriented service. That is the reason we frequently upgrade our processes, equipment and dealer support systems. Innovative manufacturing: Modern production equipment, continuous quality improvement programs, up-to-date facilities, user friendly computer operating system and quoting software. Innovative marketing: 2008 Crystal Achievement Award winning literature, successful point-of-sale materials, AIA support, useful customer service website and company website. Innovative sales approach: Strategically placed dealer partners, national show presence, on-site training, plant tours and visits, managed territory growth. Innovative products: Fold-a-way patio doors, pushout casements, BetterVue screens, retractable screens, StormPoint impact rated products, Energy Star compliant product lines and always more in development. Our specially designed windows and patio doors are made to order, with your individual specifications and design requirements. Each window is crafted to fill the order criteria and is never picked from a predetermined inventory. Product enhancements may include needs such as special sizing, custom paint, safety glass, energy performance products, and coastal units. 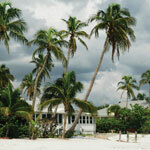 Have a remodeling situation? Some unique features such as historical grill configurations, jamb extensions, jamb jacks and exterior trim pieces may be requested. This is just a small sample of how our option-based window platform can work for you. At Lincoln, we take extraordinary care to construct products tailor-made for your very individualized project.